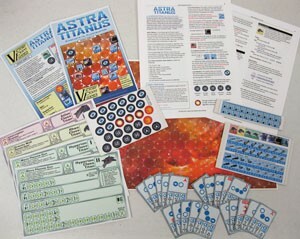 "Astra Titanus is a solitaire game of space opera battles featuring fleets of highly advanced military starships that are dwarfed by a single alien robotic ship - a STAR TITAN. The Titan is controlled by cards that determine movement, special weapon use and targeting priorities. The human ships “jump” across space using FTL drives. There are energy beams that shatter small moons and missiles that accelerate to a substantial fraction of c, the speed of light. As Admiral, you must send your sailors out into the void against the overwhelming might of the Astra Titanus!" 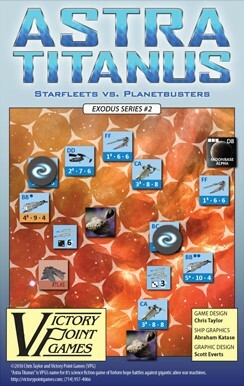 2/6/2011 - Astra Titanus is a new solitaire game available from Victory Point Games. Play time is 45-90 minutes depending on the scenario.